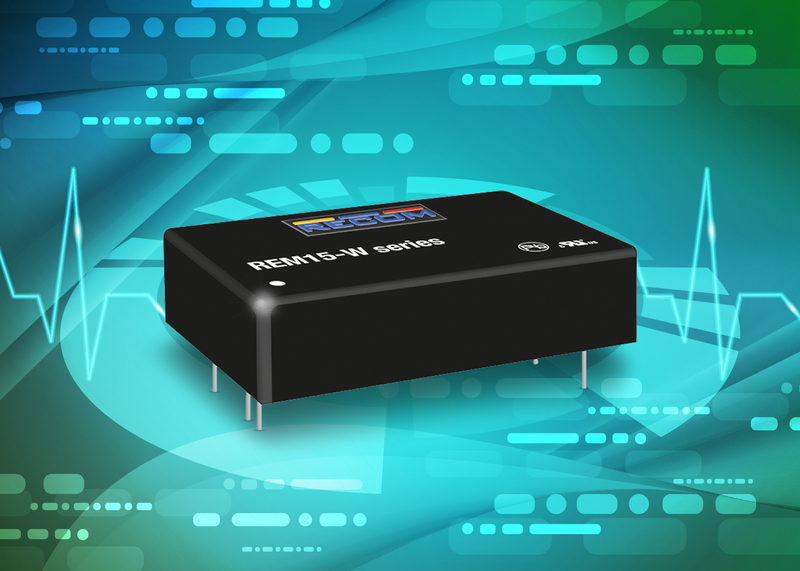 The REM15-W, REM20-W and REM30-W deliver up to 30W for patient-connected applications and are the latest medical-certified DC/DC modules from the manufacturer to deliver high power from a small outline. They also meet safety requirements for 2MOPP (means of patient protection) at 250V AC. The 15, 20 and 30W modules have a wide input-voltage ratio of 4:1 and high conversion efficiency for operation in ambient temperatures from -40 to 105°C, cooled only by natural convection. The modules have a compact footprint of 40.6 x 25.4mm (1.6 x 1.0-inch) or 50.8 x 25.4mm (2.0 x 1.0-inch) for the REM30-W. All have internal 8.0mm creepage/clearance and 5kV reinforced isolation to meet medical safety standards. They are certified to IEC 60601-1 3rd Edition and have just 2µA leakage, making them compatible with all classes of patient contact up to CF for direct heart contact. The small size means the modules are easily integrated in space-constrained designs. They have a choice of output voltage options, namely a single 5.0, 12, 15 or 24V output, or dual outputs of ±5.0, ±12 or ±15V. Output power integrity is high, with tight voltage regulation, low output ripple, and zero-load operation. The outputs also feature short-circuit and overload protection. Single and dual-output variants have nominal input voltage of 24 or 48V, giving a wide supply range of 9.0 to 36V or 18 to 75V. All three modules are certified to CB, IEC/EN and ANSI/AAMI standards including 62368-1, UL and CE marked, and are supplied by Dengrove with a manufacturer’s five-year warranty.